30 Second Wine Advisor: Is good cheap Pinot coming back? Stock up for the Holidays during CWC's Wine Sale! Save up to 70% on The California Wine Club's Award-Winning Wine! Is good cheap Pinot coming back? It's been seven years now since the movie Sideways famously celebrated Pinot Noir and demonized Merlot, a comedic meme that had a surprising impact on the real-world wine market. Three years after the movie-driven Pinot Boom, I wrote in the Sept. 13, 2007 30 Second Wine Advisor, Pinot Inflation, that the Pinot trend showed no signs of abating. "The ongoing Pinot craze," I opined, "is having some effects that shouldn't really have been that hard to anticipate: Increasing demand for quality Pinot Noir grapes is driving up prices at the vineyard, and that translates to higher prices at the retail store. The good wines aren't cheap, and the cheap wines aren't good." Well, here's good news! While I don't have sufficient data to call it a trend, in recent months I've run across two decent yet "affordable" Pinot Noirs that I would definitely buy again and recommend. For what it's worth, both come from Northern Italy. In April, I reported favorably on Franz Haas 2009 "Kris" Pavia Pinot Noir ($12.99) from Lombardia; this week I've got good words for Avanti 2009 Delle Venezie Pinot Noir ($9.99) from the Veneto. Avanti is apparently bottled only for the U.S. market by Casa Vinicola Botter Carlo in Fossalta di Piave, in the broad Adriatic plain not far east of Venice, where long rows of grapes destined mostly for modest wines grow in a setting not unlike California's Central Valley. If that sounds dismissive, though, a taste of the wine suggests otherwise. While it's no great Burgundy, it shows distinct Pinot Noir character, clean and fresh, with a sturdy metal screw cap to keep it that way. Well structured with a good balance of red fruit, firm acidity and background tannins, it's good with food yet not too haughty for sipping as a "glass of red." Save up to 70% on Award-Winning Wine! This is the perfect time to stock up for the coming holiday season! The California Wine Club is having their last sale of 2011, with award-winning, limited-production wines priced as low as $6.99 per bottle. You can mix a case of 12 favorites or try some new wines. Every wine has been hand-selected from a small family winery by Bruce and Pam Boring, proprietors of The California Wine Club, and is backed by their 100% satisfaction guarantee! Be sure to pick up some Cabernet to savor on crisp fall evenings and some Pinot Noir to pair with your Thanksgiving dinner! Click here or call The California Wine Club at 1-800-777-4443 to shop now and save! FOOD MATCH: Versatile as Pinot should be. Good with red meat, pork and poultry, wild salmon and cheeses. Fine with a hearty vegetable main course, fresh green beans blanched and combined with stir-fried onions and green peppers, garlic and ginger in a lightly spicy sauce of white and brown miso,ponzu and lime. VALUE:The $10 range is an attractive neighborhood for balanced, food-friendly Pinot Noir from any part of the world. Wine-Searcher-com reveals U.S. retail prices ranging from $7.69 to $12.99. WHEN TO DRINK: It's not really a wine made for cellaring, but balanced Pinot quality, tannins and a modern screw cap closure would make me comfortable about holding it under good conditions for up to five years. Would it improve? Hard to say, but it wouldn't cost much to set a bottle or two aside and find out. WEB LINK: Here is an importer's commercial fact sheet on the Avanti Pinot Noir. 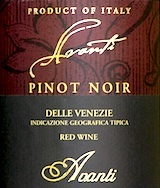 Find vendors and compare prices for Avanti Delle Venezie Pinot Noir on Wine-Searcher.com.